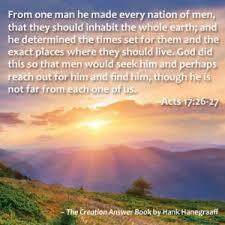 To start with we know from the Bible that God has created us with the ability to SEEK him and FIND him, even though he is not far from any one of us. It’s for this purpose that he has formed us. There is much joy in heaven for each person who repents, because this means that a person has gone from death to life and God doesn’t want anyone to perish. John 1:8 He was not that Light, but was sent to bear witness of that Light. 9 That was the true Light which gives light to every man coming into the world. 2 Pet. 3:9 The Lord is not slack concerning His promise, as some count slackness, but is longsuffering toward us, not willing that any should perish but that all should come to repentance. 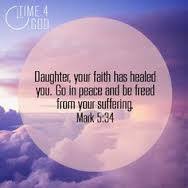 Mark 5:24 And He said to her, “Daughter, your faith has made you well. Go in peace, and be healed of your affliction. Acts 14:9 This man heard Paul speaking. Paul, observing him intently and seeing that he had faith to be healed, 10 said with a loud voice, “Stand up straight on your feet!” And he leaped and walked. Luke 17:.17 And Jesus answering said, Were there not ten cleansed? but where are the nine?18 There are not found that returned to give glory to God, save this stranger.19 And he said unto him, Arise, go thy way: THY FAITH HATH MADE THEE WHOLE. Matthew 15:28 Then Jesus answered and said unto her, O woman, GREAT IS THY FAITH: be it unto thee even as thou wilt. And her daughter was made whole from that very hour. Mark. 5:34 And he said unto her, Daughter, THY FAITH HATH MADE THEE WHOLE; go in peace, and be whole of thy plague. Luke 18:41 Saying, What wilt thou that I shall do unto thee? And he said, Lord, that I may receive my sight.42 And Jesus said unto him, Receive thy sight: THY FAITH HATH SAVED THEE.43 And immediately he received his sight, and followed him, glorifying God: and all the people, when they saw it, gave praise unto God. Mark 6:4 But Jesus said to them, “A prophet is not without honor except in his own country, among his own relatives, and in his own house.” 5 Now HE COULD DO NO MIGHTY WORK THERE, EXCEPT THAT HE LAID HIS HANDS ON A FEW SICK PEOPLE AND HEALED THEM. 6 And He marveled because of their UNBELIEF. Then He went about the villages in a circuit, teaching. Matthew 8:8 The centurion answered and said, Lord, I am not worthy that thou shouldest come under my roof: but speak the word only, and my servant shall be healed. —13 And Jesus said unto the centurion, Go thy way; and AS THOU HAST BELIEVED, SO BE IT DONE UNTO THEE. And his servant was healed in the selfsame hour. Matt. 17:14 And when they were come to the multitude, there came to him a certain man, kneeling down to him, and saying,15 Lord, have mercy on my son: for he is lunatick, and sore vexed: for ofttimes he falleth into the fire, and oft into the water.16 And I brought him to thy disciples, and they could not cure him.17 Then Jesus answered and said, O FAITHLESS AND PERVERSE GENERATION, how long shall I be with you? how long shall I suffer you? bring him hither to me.18 And Jesus rebuked the devil; and he departed out of him: and the child was cured from that very hour.19 Then came the disciples to Jesus apart, and said, Why could not we cast him out?20 And Jesus said unto them, BECAUSE OF YOUR UNEBELIEF: for verily I say unto you, If ye have faith as a grain of mustard seed, ye shall say unto this mountain, Remove hence to yonder place; and it shall remove; and nothing shall be impossible unto you.21 Howbeit this kind goeth not out but by prayer and fasting. Also 1 Corinthians 12-14 concerns the spiritual gifts. Paul says ”There are diversities of gifts, but the same Spirit”. He says that the Spirit is distributing these gifts to each one has he wills, but he also tells us to COVET EARNESTLY the best gifts. Too many christians are of the opinion that the spiritual gifts have ceased, but some of them still concede that ”Sure, if God one day hits me with some of these gifts out of the blue, then who am I to object”? Meaning, they wait for God to take action despite of their disinterest and objections to the spiritual gifts, and by being so reluctant they disobey Paul who tells us to EARNESTLY DESIRE the best gifts. Instead of earnestly desire these gifts, they might choose to discourage others from having this type of desire by telling them that the gifts have passed and are not for today. Flee from a pastor who warns you and discourages you from seeking the gifts. Satan is thrilled each time he can disarm a christian person and make him weaker. If healing, prophesying and speaking in tongues have ceased, then so have faith, wisdom, knowledge and ”discerning of the spirits”, which can be found on the same list. ”Faith” is here listed separately, and it could for instance concern the hopes and expectations that we have when we take the time to pray. If we believe that praying is a more or less a waste of time and that God either doesn’t hear our prayers or that everything is predetermined, then it’s a risk that become weak when we pray (if we pray at all). It could also concern our faith in relation to prophesies and dreams – that God is able to express himself through such means (this could be combined with discerning the spirits) – and that we are able to find ourselves in ”divine appointments” with other individuals in our daily lives which we should make use of. Another example could be when we are trusting in God for providing financial aid in a difficult situation, and there are numerous testimonies from christians who give account of miracles that they have experienced when they are being provided money precisely when needed in a very urgent situation which they have prayed about. If we have a strong faith in that God is able to lead us in our daily life, we have accomplished much and our faith can grow even further. We will understand the power of prayers and that we can be useful tools for others, just like other people can be used by God to enlighten and encourage us. 1 Cor. 12:8 for to one is given the word of wisdom through the Spirit, to another the word of knowledge through the same Spirit, 9 to another faith by the same Spirit, to another gifts of healings by the same Spirit, 10 to another the working of miracles, to another prophecy, to another discerning of spirits, to another different kinds of tongues, to another the interpretation of tongues. 11 But one and the same Spirit works all these things, distributing to each one individually as He wills. 1 Cor. 12:30 Do all have gifts of healings? Do all speak with tongues? Do all interpret? 31 But EARNESTLY DESIRE the best gifts. And yet I show you a more excellent way. Romans 12 shows us how Paul beseeches the christians in Rome, and all of us, to live holy lives in order to be acceptable to God, and to be transformed by the renewing of our mind. Rom. 12:1 I beseech you therefore, brethren, by the mercies of God, that you present your bodies a living sacrifice, holy, acceptable to God, which is your reasonable service. 2 And do not be conformed to this world, but be transformed by the renewing of your mind, that you may prove what is that good and acceptable and perfect will of God.3 For I say, through the grace given to me, to everyone who is among you, not to think of himself more highly than he ought to think, but to think soberly, as God has dealt to each one a measure of faith. 4 FOR as we have many members in one body, but all the members do not have the same function, 5 so we, being many, are one body in Christ, and individually members of one another.6 Having then gifts differing according to the grace that is given to us, let us use them: if prophecy, let us prophesy in proportion to our faith; 7 or ministry, let us use it in our ministering; he who teaches, in teaching; 8 he who exhorts, in exhortation; he who gives, with liberality; he who leads, with diligence; he who shows mercy, with cheerfulness. As we can see, Paul has spiritual gifts in mind when he speaks about ”faith” in v. 3 (the previous verse). He says in v. 4 ”let us prophesy in proportion to our faith”, because the truth is that not everyone has the gift of prophesying – often because they don’t even believe in the spiritual gifts . Paul says ”Let us use them”, indicating that some of us are not using our gifts even though they are provided to us, and one reason might be lack of boldness. Which gifts we possess are dependent on our willingness to seek the gifts (as we are told) and which gifts the Spirit provides us (God’s grace). Apart from using faith in relation to prophesy, Paul also mentions ministering, teaching exhorting, giving, leading and being merciful. These are all areas where a strong faith is very useful, and the more we see what God can do, the more our faith can grow and we become more bold – fervent in spirit, serving the Lord. Not all of us are for instance teachers, but we can all do something for the Kingdom of God, depending on our personalities, talents, gifts and faith. We are all different members of the same body. 9 Let love be without hypocrisy. Abhor what is evil. Cling to what is good. 10 Be kindly affectionate to one another with brotherly love, in honor giving preference to one another; 11 not lagging in diligence, fervent in spirit, serving the Lord; 12 rejoicing in hope, patient in tribulation, continuing steadfastly in prayer; 13 distributing to the needs of the saints, given to hospitality.14 Bless those who persecute you; bless and do not curse. 15 Rejoice with those who rejoice, and weep with those who weep. A person can be healed through faith in his name (either from the one who heals, or the one getting healed, or both). The following verse is both about believing in Jesus, and believing in the power that extends from him – so that we are able to expect a person getting healed. Acts 3:16 And His name, through faith in His name, has made this man strong, whom you see and know. Yes, the faith which comes through Him has given him this perfect soundness in the presence of you all. If we have a strong faith, we can better endure persecutions and tribulations, and we can better learn the power of a prayer. There is a risk that we might habitually pray but still lack faith in that God will respond. It’s like going in to a store and by the counter ask for a certain product, and when the salesperson says ”Sure, one moment please” and leaves the counter in order to get what you ask for, you stand there with doubts if this person is actually going to return with your product. ”Maybe the product is out of stock, or maybe the salesperson forgot about me or went for lunch?” So you just leave the store without getting the product that you asked for, even though you had the chance and should have endured. 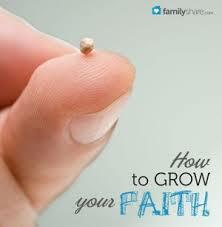 We can learn to grow in faith. 2 Thes. 1:3 We are bound to thank God always for you, brethren, as it is fitting, because your faith grows exceedingly, and the love of every one of you all abounds toward each other, 4 so that we ourselves boast of you among the churches of God for your patience and faith in all your persecutions and tribulations that you endure, 5 which is manifest evidence of the righteous judgment of God, that you may be counted worthy of the kingdom of God, for which you also suffer; 6 since it is a righteous thing with God to repay with tribulation those who trouble you,7 and to give you who are troubled rest with us when the Lord Jesus is revealed from heaven with His mighty angels, 8 in flaming fire taking vengeance on those who do not know God, and on those who do not obey the gospel of our Lord Jesus Christ. 9 These shall be punished with everlasting destruction from the presence of the Lord and from the glory of His power, 10 when He comes, in that Day, to be glorified in His saints and to be admired among all those who believe, because our testimony among you was believed. If God would hand out various amounts of ”faith” to us , as an ability to even believe in him, it wouldn’t make sense for Jesus to request us to believe in him if he is aware of that some of us lack the faith to do it. John 10:37 If I do not the works of my Father, believe me not.38 But if I do, though ye believe not me, BELIEVE THE WORKS: that ye may know, and believe, that the Father is in me, and I in him. It’s not biblically sound to answer Jesus ”because you didn’t provide us with enough faith”. 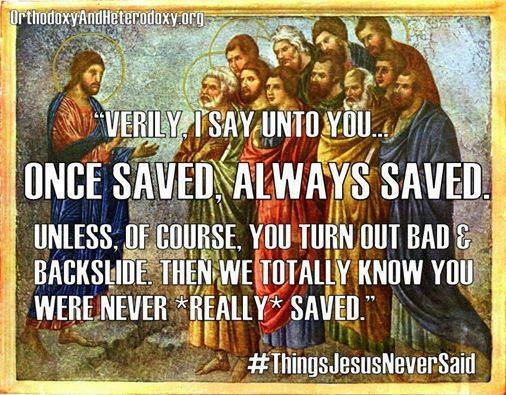 What must we do to be saved? Paul and Silas didn’t answer ”There is nothing you can do to get saved, apart from hoping that God has given you enough faith to believe in him. Just wait and see”. Rom. 10:14 How then shall they call on Him in whom they have not believed? And how shall they believe in Him of whom they have not heard? And how shall they hear without a preacher?—17 So then faith comes by hearing, and hearing by the word of God. Rom. 2: 14 for when Gentiles, who do not have the law, by nature do the things in the law, these, although not having the law, are a law to themselves,15 who show the work of the law written in their hearts, their conscience also bearing witness, and between themselves their thoughts accusing or else excusing them) 16 in the day when God will judge the secrets of men by Jesus Christ, according to my gospel. Luke 10:13 “Woe to you, Chorazin! Woe to you, Bethsaida! For if the mighty works which were done in you had been done in Tyre and Sidon, they would have repented long ago, sitting in sackcloth and ashes. Hello friend, and thanks for your message. It seems like you’ve found a blog article that I’ve forgotten that I’ve written. You can absolutely use the information on your blog and spread the truth to even more people. Jesus died for the world and we can all be saved.